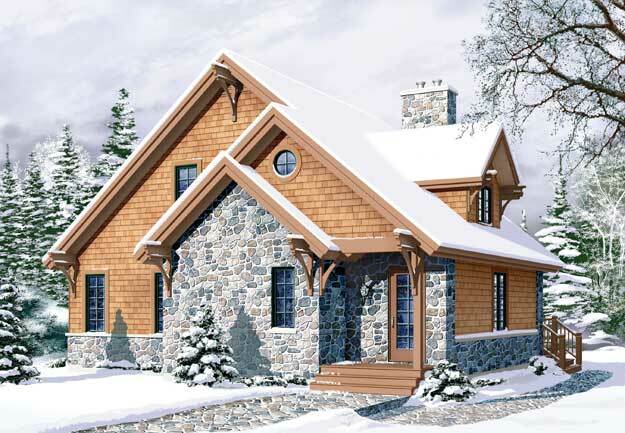 Maximum Ridge Height : 25'10"
This two-level vacation/recreation house plan abounds in rustic charm. Enter through the covered porch to the foyer with large closet for storing coats, boots, and other outdoor gear. The grand living room is graced by a cathedral ceiling, mezzanine, fireplace, and several large windows. The splendid back porch runs the length of the house. There's plenty of room for a dining table in the spacious kitchen. The private master suite includes a walk-in closet and full bath with dual-sink vanity. Upstairs, two lovely bedrooms share a full bath.